Women, booze, illegitimate children, fraud, bigamy, 19th-century capitalism, and the emergence of an empire . . . . These words describe the life of Isaac Merritt Singer. Although widely regarded as the inventor of the sewing machine, Singer actually modified an existing machine and marketed it to an America eager for the new tools of the Machine Age. His genius was in the advertising, service with a smile, installment plans, and marketing gimmicks he used to get the sewing machine in homes and sweatshops all over the world. This fascinating and detailed biography provides an insightful and provocative look at the American entrepreneur, unraveling a complex web of personal ambition, fame, fortune, and the attainment of the American Dream. Illustrated. 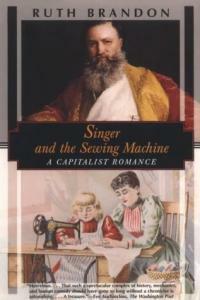 The sewing machine was invented, or so he claimed, by Isaac Merritt Singer. In 1905 and 1906, long after his death, his eldest son, William Singer, retailed what he knew of Isaac’s life in a series of letters to his half-sister Winnaretta, by then Princesse de Polignac. Being thirty-one years older than Winnaretta, William had had considerably more acquaintance with their father. He was, however, rather reticent. ‘It would deeply interest you to know all his wonderful and very unusual history, but it better not be on paper. When we meet I will tell you if you wish,’ he wrote. Seems like times never change. Way back when, there was big competition to come up with the best sewing machine. Kind of like coming up with the best mobile phone or app. There were plenty of sewing machines around, but Isaac Singer was the first to build a commercially successful, mass-produced machine. He filed his patent on Aug. 12, 1851. Singer built the first machine where the needle moved up and down rather than side to side. And the machine was powered by a foot treadle, not by cranking a side wheel. 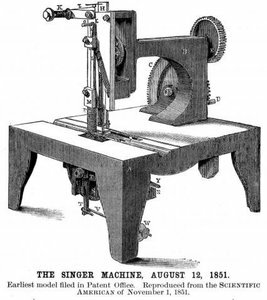 But Singer's machine used the same lock stitch that had been patented by Elias Howe, another sewing machine inventor. Howe sued Singer and won, with Singer having to pay him patent royalties. Sounds like your typical fight in fashion over who invented what first. According to the U.S. Census Bureau, some 15,000 entities in the country employ 180,000 workers in clothing manufacturing. Sewing machines might have gone electrical, but they are pretty much the same.